It’s that time of year again folks! The Board of Education needs your help in deciding where to allocate funding for the 2019/20 budget to best reflect the District’s educational and operational activities. This year’s survey focuses on three main topics: Early Years’ Programming, Wellness, and Programs of Choice. We have designed the seven-question budget survey to be concise and respectful of your time, and have included many areas to elaborate or expand on your thoughts while providing space to share items that may not be part of the budget questions. The survey also has information on advancements the Board has made as a result of past community and survey feedback. 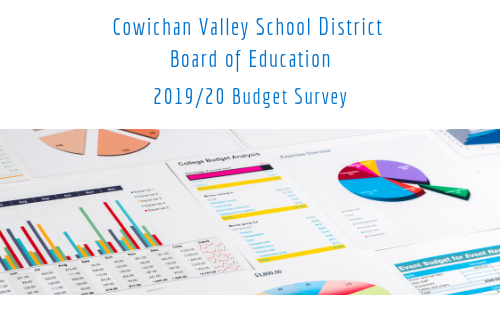 Thank you so much for taking the time to help shape the future of the Cowichan Valley School District.